I’ve never been a great baker but I love pastries, savoury especially. Chicken pies, beef pies, creamy mushroom pies.. I love them all. But I have a problem making them because I never seem to figure out how I would have a clean “lightly floured surface” to roll out those pastries. Where do you do it? On the tabletop? So I buy pastry sheets. I had some shortcrust left over from when I made the mushroom quiche, and thought to put them to good use. The thing about buying frozen sheets is that they are never as buttery as you would like. Something’s amiss, but I cannot alter the texture or taste, and this is the frustrating thing about buying pre-packaged items. Ah-mm and 88 liked this. 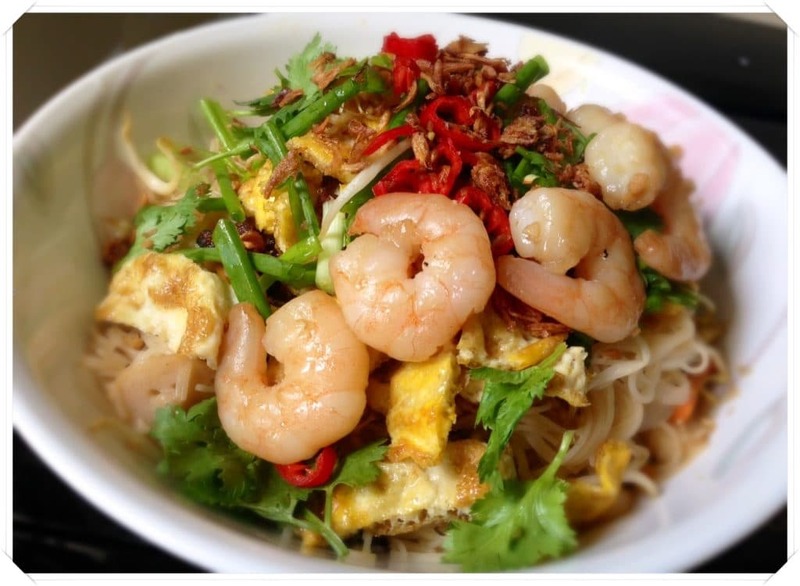 It is something different from the regular “western” food we usually have, and crispy to eat and fun to look at. They had kinda the same reaction when I made risotto the other time.. at first 88 approached it warily (as she does with any unfamiliar food), then tucked into it happily. Ah-mm’s approach to new foods is different.. she dives straight in to enjoy different tastes presented to her. She’s easier to cook for in a way, but 88′s easy to cook for also because she’s predictable. Do I understand what I’m saying? 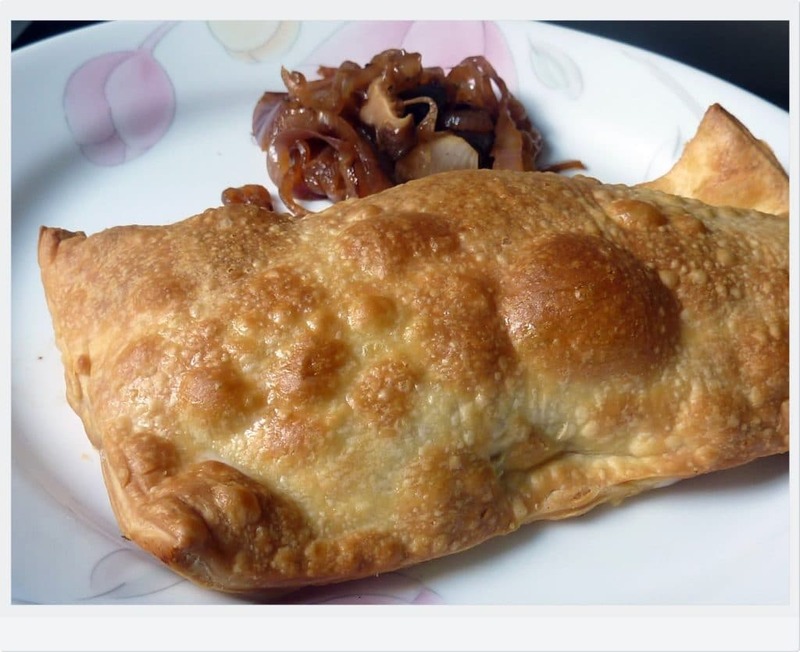 Along with the pastry pockets, I also made caramelised onions with shitake mushrooms. These are not yet caramelised enough, but I wanted some bite to the onions. 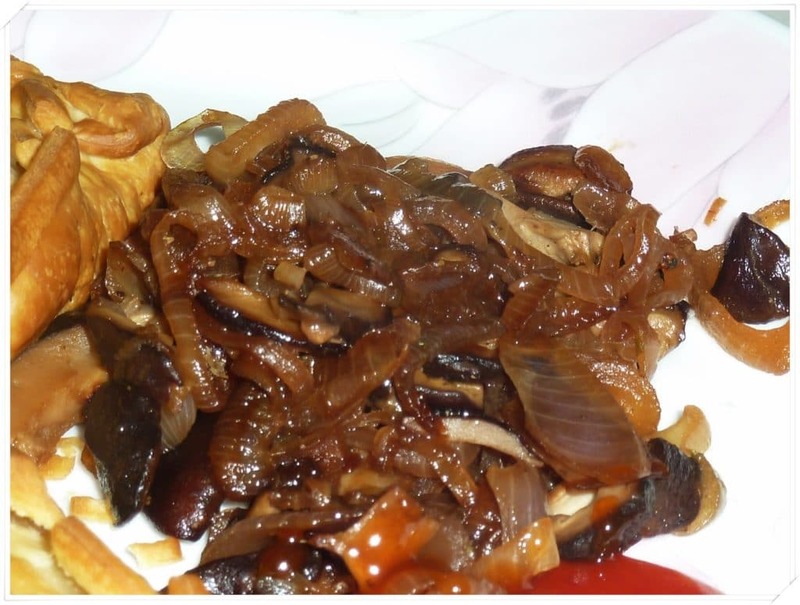 To make these, I sauteed onions with some oil in a skillet, then added sliced mushrooms. Cook til the onions are soft then deglaze the pan with white wine. Add some sprinkling of salt at the end. 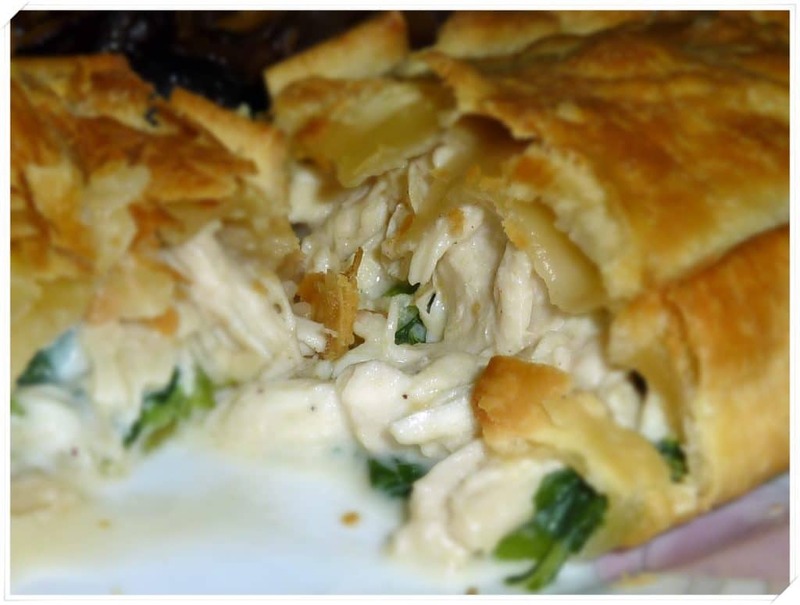 I decided to make chicken mayo with cream-cheese spinach as the filling. This would be nice with a potato, carrot, celery and chicken filling ala chicken pie! You can also fill it with sardines and tuna, and even make smaller portions of it as a snack. 1. Take the pastry sheets out from the freezer before preparing the ingredients. 2. Boil the chicken til cooked. Reserve 3 tbsp of water. When chicken has cooled, shred and add the mayo, garlic power, chicken seasoning, reserved water, and salt and pepper. 3. Boil spinach, squeeze dry and roughly chop. 4. Heat up a pan and fry onions in oil or butter. After 3 minutes, add cream cheese and cooked spinach. Set aside to cool. 5. Cut pastry sheet into two when it is soft enough to handle. 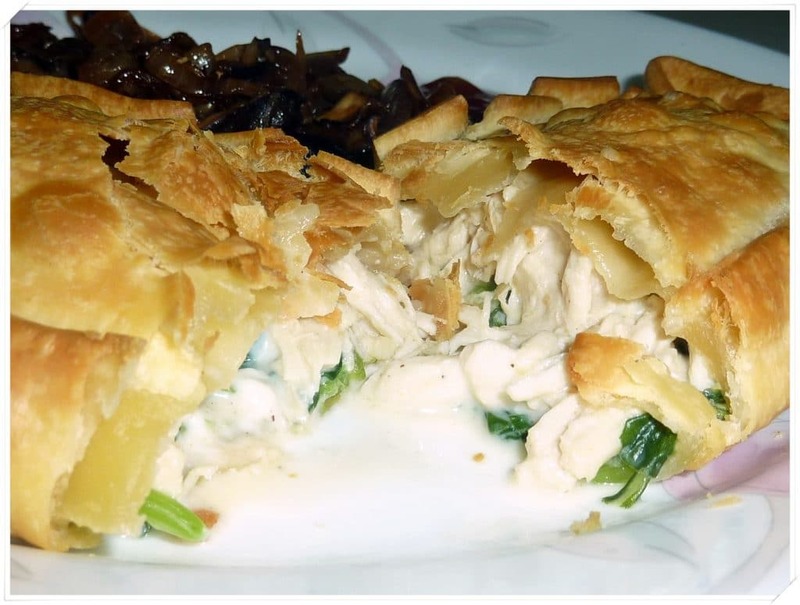 Then lay the spinach in the middle of one-half of pastry sheet and top with mayo chicken. 7. Spray with cooking spray then airfry for 15 minutes at 180 degrees. Alternatively, bake at 200 degrees in the oven for 20-25 minutes or until crust is golden. This is quite easy to make since we’re not making the pastry from scratch. Try it, I think you’ll like it! I’m keeping the rest of the pastry sheets for a classic chicken pot pie and hopefully will make it sometime next week. Caramelising onions is an important part of enriching the taste of savouries, Whenever I caramlise onions I usually put a spoonful or so of balsamic vinegar with them. The sharpness of the vinegar balances the sweetness of the onions, the balsam gives a beautiful complimentary aroma and flavour. You de glaze with white wine. You could also add balsamic vinegar to the wine, but I prefer to splash it onto the onions…. (it is a bit of a treat for my nose!) I know what you mean about the shop bought pastry, it is rarely satisfactory. Too often there is no butter in either the puff pastry or shortcrust but some combination of cheap margarine or hydrogenated fats. But there is one here called BORGS. It is only available in Australia in a few stores (Woolworths and Safeway). You might be able to find it in Singapore if you are lucky. It produces superior results always. For children (and elderly parents!) I have a Breville pie maker which makes 4 pies perfectly and very quickly every time with crisp well cooked pastry and it keeps the flavours in. Usually I make about 20 at a time. I know a pie maker is cheating :-) but if you want to make some pies quickly and without the fuss of a lot of pastry prep it is ideal. Hi Geoff, thanks for your tip about adding balsamic vinegar to onions.. I would prefer to splash it straight to the onions too! As a matter of fact I bought BORGS pastry from the supermarket! The shortcrust is not as “shortcrust” as I would have liked and it turns out a little bit dry. I’m wondering if it’s something to do with my oven temperature. It’s a great alternative than having to roll out pastry dough on my tabletop though.. I always imagine all kinds of bacteria sticking to the dough so I’ve never got around to making any pastry from scratch! Rest assured that if you did make pastry on your table top any bacteria unfortunate enough to cling to the dough is destined to be totally destroyed in the cooking process. If you saw how pastry, or many other products are made in factories, you would not be assured of sterility at all and you would neither buy or eat them! Even raw flour itself contains bacteria, dirt and other “organic bits”. Your table top if it does have bacteria on it is probably benign or harmless and probably you are immune to it being from your house or person (s). Remember that pasteurisation of milk is at 78degrees C. Boiling items (100C) sterilises them sufficient for surgery. You would be cooking pastry at 150-180C and nothing would survive that! Make your pastry. It is a very rewarding process and once you start, you will want to practice. In Singapore you must watch the temperature of the dough and keep it cool for shortcrust. Choose your flour carefully, avoid high gluten or strong flours for pastries. As for Borgs pastry….I am pleased and surprised that you have it. That was most unexpected! I have found sometimes that Borg’s pastry, both shortcrust and puff pastry can be too moist, the opposite of your experience. Maybe it is your oven, temperature and maybe timing. It could be that you are baking too low a temperature for too long. is that possible?